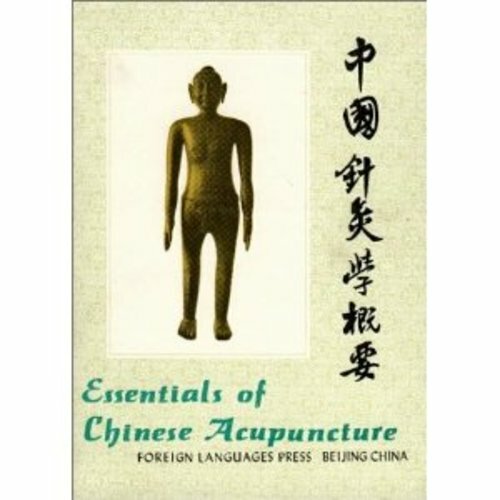 Written and compiled by Beijing College of Traditional Chinese Medicine, Shanghai College of Traditional Chinese Medicine, Nanjing College of Traditional Chinese Medicine, and the Acupuncture Institute of the Academy of Traditional Chinese Medicine. Foreign Language Press, Beijing, First Edition, 1980.
phases of Acupuncture. It is also excellent enough to be a stand-alone textbook for anyone interested in this Chinese Science. full essays on all Meridians and the medical uses of each acupuncture point. Annotations, notes and full printing of all pages is enabled. Hardcover: 432 pages Publisher: Foreign Languages Press; 1ST edition (January 1, 1993) Language: English ISBN-10: 7119002406 ISBN-13: 978-7119002408 Product Dimensions: 10.3 x 7.7 x 1.4 inches PREFACE FOREWORD TO THE FIRST EDITION FOREWORD TO THE SECOND EDITION INTRODUCTION PART I A General Description of the Basic Knowledge of Traditional Chinese Medicine CHAPTER I YIN-YANG AND THE FIVE ELEMENTS I. YIN-YANG 1. The opposition and interdependence of yin and yang 2. The inter-consuming-supporting and the inter-transforming relation of yin and yang II. THE FIVE ELEMENTS 1. Attribution of things to the five elements 2. The inter-promoting, inter-acting, over-acting and counter-acting relation of the five elements CHAPTER II ZANG-FU (INTERNAL ORGANS) I. THE ZANG ORGANS 1. Heart 2. Liver 3. Spleen 4. Lung 5. Kidney 6. Pericardium II. FU ORGANS 1. Small intestine 2. Gall bladder 3. Stomach 4. Large intestine 5. Urinary bladder 6. Sa'njlao III. EXTRAORDINARY ORGANS 1. Brain 2. Uterus CHAPTER III CHANNELS AND COLLATERALS I. NOMENCLATURE AND CLASSIFICATION II. FUNCTIONS OF CHANNELS AND COLLATERALS CHAPTER IV QI, BLOOD AND BODY FLUID I. QI II. BLOOD III. BODY FLUID CHAPTER V ETIOLOGY I. SIX EXOGENOUS FACTORS 1. Wind 2. Cold 3. Summer heat 4. Damp 5. Dryness 6. Heat (fire, mild heat) II. SEVEN EMOTIONAL FACTORS III. MISCELLANEOUS PATHOGENIC FACTORS 1. Irregular food intake 2. Over-strain and stress or lack of physical exertion 3. Traumatic injuries 4. Stagnant blood and phlegm CHAPTER VI METHODS OF DIAGNOSIS I. INSPECTION 1. Observation of the expression 2. Observation of the color 3. Observation of the appearance 4. Observation of the tongue II. AUSCULTATION AND OLFACTION 1. Listening 2. Smelling III. INQUIRING 1. Chills and fever 2. Perspiration 3. Food and drink, appetite and taste 4. Defecation and urination 5. Pain 6. Sleep 7. Menses and leukorrhea IV.